SEAL Analytical recently acquired Thomas Cain, designer and manufacturer of automated sample preparation equipment. This includes automated chemical addition, heating and mixing to reduce the need for manual handling and addition of hazardous chemicals and strong acids during the sample preparation and / or digestion process. The DEENA gives the option for full automation from creation of standards to addition of reagents, mixing, digestion and reconstitution of sample volume. This increases safety and reproducibility in the dispensing and mixing of hazardous chemicals and strong acids. The DEENA is fully controlled by a PC and the ASD (Automated Sample Digestion) software. The software is fully programmable and the processes are customizable based on your labs required methods. Many methods come pre-programmed for your convenience including common mercury and trace metals methods, which can be customized for your particular samples and digestions. For labs that are looking to automate sample prep but do not require digestion or heating in their sample preparation, there is the ERICA. The ERICA gives all of the benefits of the DEENA but can be paired with Microwave digestion or other processes that simply require the automated preparation of standards and reliable addition of reagent to the samples and standards. For labs that want to perform digestions but are not looking for automation, there is the SMARTBLOCK. The SMARTBLOCK uses the same heating technology and corrosive resistant materials as the DEENA. It is a reliable and durable graphite block for mercury and metals digestions. SEAL Analytical is excited to welcome Thomas Cain to the SEAL group. The addition of these systems will allow SEAL to further serve the water and soil analysis market. Scientists working on the Hawaii Ocean Time-series (HOT) program have been making repeated observations of the hydrography, chemistry and biology of the water column at a station north of Oahu, Hawaii since October 1988. HOT is based out of the School of Ocean and Earth Science and Technology (SOEST) at the University of Hawaii and receives funding from the U.S. National Science Foundation. The objective of HOT research is to provide a comprehensive description of the ocean at a site representative of the North Pacific subtropical gyre. 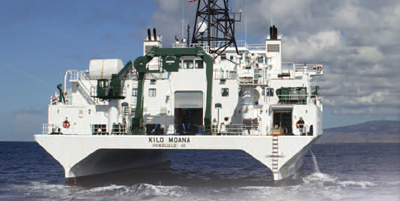 Cruises are made approximately once per month to the deep-water Station ALOHA (A Long-Term Oligotrophic Habitat Assessment; 22° 45'N, 158° 00'W) located 100 km north of Oahu, Hawaii. Measurements of water column chemistry, currents, optical properties, primary production, plankton community structure, and rates of particle export are made on each cruise. Both inorganic and organic nutrient samples are analyzed to provide a description of water column chemistry. Nutrient samples are collected on each cruise from the surface ocean and to a depth of ~4800m. The samples are frozen and brought back to the lab for analysis of NO3+NO2, PO4, and Si(OH)4 concentrations. These seawater nutrients are analyzed using a SEAL Analytical AutoAnalyzer 3 (AA3) Segmented Flow Analyzer. Samples are loaded onto the sampler and analyzed colorimetrically for each nutrient simultaneously, thus generating around 300 tests an hour. Susan Curless (pictured above with the AA3) works for the Hawaii Ocean Time-series program, and has acted as the lead nutrient analyst for the program since January 2005. Their AA3 has been used to fully support the nutrient analyses required for the HOT program since then. Susan is also one of the chief scientists of the HOT program, so when she is not out at sea organizing, planning, and leading research cruises, she is in the laboratory analyzing nutrient samples on the SEAL AutoAnalyzer 3. Susan recently acquired a LWCC 1000mm capillary flowcell which she will soon start experimenting with on the AA3 for ultra low level nitrite, ammonium and urea. These capillary cells are the latest technology for achieving detection limits in the parts per trillion. Susan also utilizes the AA3 for nutrient samples collected on CMORE (Center for Microbial Oceanography: Research and Education) cruises. SEAL Analytical are world-wide leaders in the supply of segmented flow analyzers for Seawater community. The high precision and reproducibility, robust design and low detection limit of SEAL analyzers make them the first choice for seawater analysis. Leading seawater laboratory and research institutes use the SEAL AutoAnalyzer and QuAAtro. As well as being reliable laboratory instruments, these analyzers are designed to stand up to tough conditions on board an oceangoing research vessel, and are in routine ship-board use from the Arctic Ocean to the Weddel Sea. The latest instruments use LED light sources which have long life and are unaffected by vibration and are extremely stable. They were developed specifically for trace-level on-board seawater analysis. LWCC is a flowcell used for ultra-sensitive absorbance measurements with SEAL SFA instruments. It is a flowcell with a long optical path length that allows sample measurements at very low concentrations. Compared with a standard 10 mm flowcell, a 1 mAU signal is enhanced 100 fold to 100 mAU when using the 1000 mm LWCC. This means that your Gain value is lower and noise is greatly reduced. Path lengths range from 500 to 5000 mm. The sample solution is introduced into the LWCC at the liquid input via AA3HR or QuAAtro where the light is coupled into the LWCC from the HR photometer via fiber optic cables. As mentioned on Page 2 in the HOT article, water researchers are using the LWCC for next generation experiments in determining low level nutrients. Initial studies for Nitrite indicate with a calibration range of 0 – 10 ppb (0 – 0.71 µM), the gain is approximately 13 and the estimated detection limit is 0.013 ppb as N (0.0009 µM). BIOS – Bermuda, University Plymouth, UK and many more. The following week, we attended the Pittcon conference in a much snowier and colder Chicago. It was a very well attended conference with over 12,000 delegates. The Pittsburgh Conference on Analytical Chemistry and Applied Spectroscopy is a Pennsylvania not-for-profit educational corporation. People from all over the world attended to see cutting edge innovations, attend technical sessions and workshops. Being so close to the SEAL US headquarters, it was great to see our SEAL staff meet many of our users. If you are planning to attend any of the following conferences – stop by our booth and say Hi! Did you know that SEAL offers ongoing training courses at their Milwaukee location?Spend a few days with SEAL's Technical Support Group – brush up on your chemistry, software and maintenance knowledge – increase your labs productivity. The next training course will be held in July. Spaces are limited. Reserve now! For more information, contact techsupport@seal-us.com or call 262-241-7900. Flexibility In Your Nitrate Testing! The most commonly used method in the US is EPA 353.2 - Cadmium reduction which is easily accomplished using our AQ Discrete analyzers, because we had this test in mind when the analyzers were being designed. The simple Cadmium circuit is a separate fluidic pathway that is automatically switched in line by the software when the Nitrate test is required. The Cadmium coils used are solid extruded cadmium that is covered for safety and ease of handling. Regeneration is easy too. The AQ software was designed with a special utility for automated Cadmium regeneration. Just add the CuSO4, buffer and high standard and the regeneration is done automatically by the system.